Speargrass: Most commonly found in the hills, meadows and ditches where a plough has never touched. The grass is a tall whitish-yellow plant that stands out amongst the green of the later developing native grasses. The culprits of this plant are the seed awns that are barbed. As we take our four legged friend for a stroll these grass awns act like hitchhikers. Since they are barbed, when the dog moves the awn itself moves, and can easily penetrate the skin. 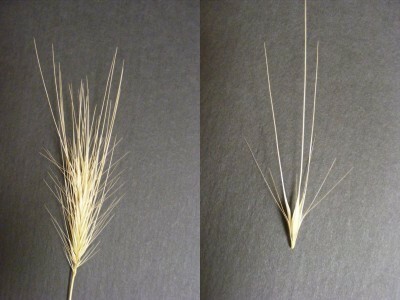 Areas in between the toes, in the ears, “armpits” and the groin are the most common places to find spear grass. Since the awn can migrate and lodge into the skin/ears foreign body infections could result. For best prevention inspect your dog after each and every walk and discourage him or her from chewing the grasses. If you see a seed or barb stuck into the skin, carefully pull it out making sure not to break it off. If your pet continually shakes their head or if you see a raised or infected area, spear grass may be the reason. Visit Vernon Veterinary Clinic if you have any concerns.